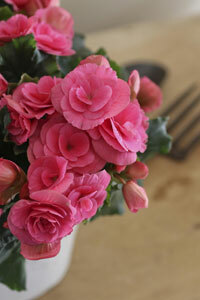 The begonia (of the Begoniaceae family) is known for its brilliant, frilly flowers and fancy foliage. This easy-to-grow flowering plant will flourish in the right place in your home. – Begonia ‘Elatior’ hybrids do best in medium-light, well-ventilated rooms. 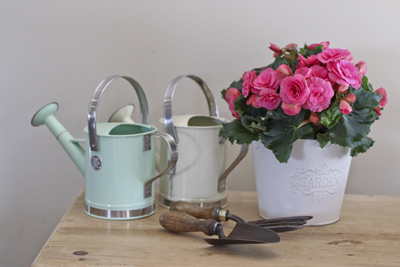 – Watering correctly is important in the care of begonias – soil should remain moist, but not too wet. Water begonias at the base to avoid leaf spot and the possibility of fungal diseases on flowers. Allow the top 20 cm or so of soil to dry out before watering again. Protect from powdery mildew by supplying adequate ventilation. Begonias are best treated as annuals and discarded when flowering has finished. – Living room spaces are perfect for begonias, as they are generally not in direct sunlight. However, if you do have a particularly sunny living room, choose another area in your home where your begonia will not be exposed to direct sunlight. Begonias look amazing as a coffee table centrepiece or clustered together with beautiful leafy plants.